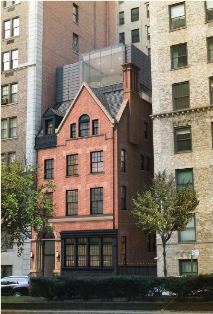 Rendering of 890 Park Avenue roof addition. Image Credit: Murdock Solon Architects. 1885 Queen Anne-style rowhouse would return to serving as a one-family dwelling; applicants said proposed work would allow light into building and provide space to compensate for lack of a rear yard. On February 2, 2015, the Landmarks Preservation Commission considered a proposal for an addition and alterations to a rowhouse at 890 Park Avenue in the Upper East Side Historic District. The Queen Anne-style brownstone was built in 1885 and designed by James E. Ware, a prominent architect of residential buildings, including the individually landmarked City and Suburban Homes Company, First Avenue Estate. It is one of only three low-rise buildings surviving along the avenue. In the 20th century, the building was converted into multiple apartments units, with ground floor retail. The applicants intend to return the building to its status as a one-family dwelling. 890 Park LLC acquired the property in 1997. According the New York Times, the LLC is an alias for Walter Schick as of 2012. StreetEasy reports that the site was purchased for $4,384,000. Shea Murdock, Partner at Murdock Solon Architects, presented the proposed work. Murdock said that because the house is surrounded by taller structures, little natural light reaches the interior. He said creating a two-story addition above the existing building would allow the residents to receive more natural light in the new upper stories, and a skylight would allow more light into the lower floors. The addition would have a rooftop terrace at the rear. New mechanical equipment and bulkhead would be installed at the rear of the roof. The proposal would also include the restoration of the historic façade, the creation of a new entry and door, and the alteration of the rear facade, which would not be visible to the public. The new addition would rise approximately 13 feet and seven inches above the existing roof, with a bulkhead and mechanical equipment reaching higher. It would be faced in glass and metal panels. The addition would be visible over the primary facade, and from multiple other vantages on public thoroughfares. The building’s entrance is currently partially below-grade. The proposed work included the creation of a new stoop, as the building would have originally possessed a stoop, and a new translucent glass entrance door that would relate to the glass of the rooftop addition. At the rear of the facade, much of the masonry would be replaced with glazing, to allow for as much light as possible to reach the interior. The Historic Districts Council called on Landmarks to flatly reject the proposal, with representative Barbara Zay stating that the project would “destroy the effect of the gabled roofline and stick out like a sore thumb.” A representative of Friends of the Upper East Side commended the planned facade restoration, but said the planned addition would “dwarf” the historic rowhouse, and its design would “read as institutional.” Christabel Gough of the Society for the Architecture of the City called the proposal “completely infeasible” given the historic building’s history, architecture and location. Landmarks Chair Meenakshi Srinivasan stated that Manhattan Community Board 2 also recommended that Landmarks deny the project permission to proceed. Commissioner Michael Goldblum opined that the site could potentially sustain a roof addition, but that the proposal visual impact needed to be severely mitigated, and should better relate to the historic building. He also found that any addition needed to better relate to the historic house, and also that the proposed glass entry door was inappropriate. Commissioner Fred Bland agreed that an addition could be appropriate, and suggested that an all-glass cube, with a more “ethereal” quality, would serve the site better. Commissioner Diana Chapin found the addition excessively visible and further determined that the rear facade needed to be simplified. Commissioner Wellington Chen suggested that any addition be sloped to minimize its visual impact from the street. Commissioner Adi Shamir-Baron said the roofline of the rowhouse needed to be preserved, and that the proposed plan conceptually failed to appropriately engage Fifth Avenue. Commissioner John Gustafsson said he could not vote to approve a visible addition at the site. Chair Srinivasan declined to call a vote, and instead asked the applicants to revise their proposal and return to Landmarks at a later date with a “much more muted” project. LPC: 809 Park Ave., Manhattan (17-3027) (Feb. 2, 2016) (Architects: Murdock Solon Architects).